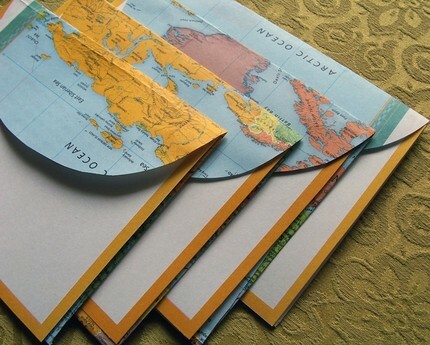 recycled map stationery | She's Crafty! Crafty Update: New Blog Feature! Just wanted to say thanks to Rebecca at Try Handmade for including me in an article she has written about eco-friendly travel tips. I’m honored to be included with such talented artists. Crafty Update: New Blog Mention! Just want to say thanks to Laura at Bright Bold Beautiful who has included my recycled map stationery in her current holiday list of “favorite things.” These puppies are taking off this year — I hope it continues! Thanks to everyone for all of your support. It was even on the front page of Etsy this morning, and as we all know, that is major exposure and something I’d been hoping for for ages! Onward! Let’s hope one day this will be my day job! !